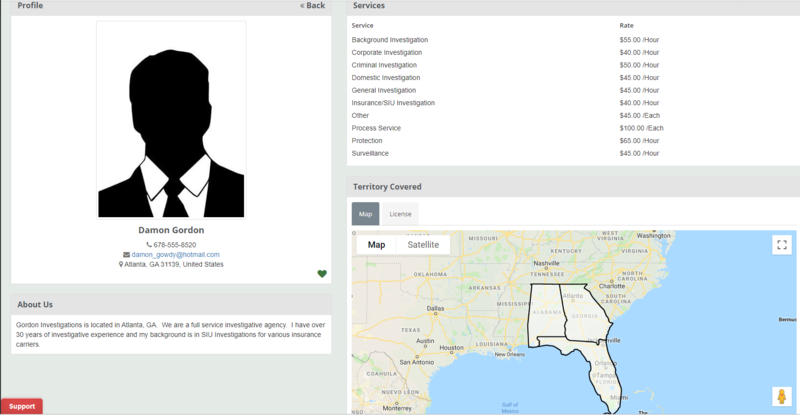 The platform allows investigators to send and receive cases to and from other investigative companies. Most investigators are familiar with colleagues looking for help on association list serves or Yahoo Groups. The Investigator Alliance accomplishes this efficiently and securely. Receive and work cases in your surrounding area or specified locations through CROSStrax. The Investigator Alliance will help you find and assign your case to investigators worldwide. Our service uses industry leading encryption to safely and privately transmit sensitive case information. What is The Investigator Alliance? The Investigator Alliance is a platform that streamlines the process of outsourcing investigative cases to other investigators. Most investigators are familiar with colleagues looking for help on association list serves or Yahoo Groups. The Investigator Alliance accomplishes the same task in a more thorough, efficient, and secure manner. Companies can instantly find qualified investigators to work cases outside of their area of expertise, coverage area or to simply try new investigators to incrementally improve performance in a certain market. This cost-effective process provides a secure portal to share case information with field investigators across the country. Investigators and companies can leverage the platform’s network of investigators to increase their case load by having the ability to securely review and accept case assignments. As an example, say ABC Investigation company in Florida has a case in Chicago, Illinois they need worked. ABC would login to the platform and search for an investigator in the Chicago area. ABC would be presented with a list of vetted investigators to choose from along with their credentials such as investigation license, proof of insurance, driver’s license and rating. The company can call and communicate with the investigator or vice versa. Rates can be negotiated so everyone is on the same page. Once chosen, the investigator in the Chicago area would be notified of a pending assignment and can choose to accept or reject the case. Once the assignment is accepted, the company can immediately push the details of the assignment to the selected investigator through the platform in seconds. Once the assignment is complete, the investigator can update the case as it progresses and securely submit the results to the company. All of this is done seamlessly and securely within the Alliance platform. If you are a current CROSStrax user? You have access to the Investigator’s Alliance! If you are NOT a current CROSStrax user, do not worry. You do not have to be. Simply to go our sign up page and submit your information for verification. A vetting fee does apply. A very small transactional fee of $4.99 per case will apply. We believe you will find this fee to be immaterial given the inherent efficiencies and controls provided and the growing investigation firm choices on the platform. By providing this selection of investigative outsourcing options, investigators and companies can obtain new clients for a fraction of what traditional sales and marketing efforts would amount to. The time and money saving benefits are paramount.